So, you have googled where you can order your paper, and almighty Google has offered you this website. Whatever you buy online, but especially if it is a writing for your school or university, there are always three main issues which usually worry you more than anything else. These are quality, price and privacy protection. So, let’s see what Customessaywriter.co.uk can offer its first-time visitors and regular customers. Availability of writers who hold Ph.D. is definitely promising. However, what if you would like to have a quick look through the samples of your personal writer’s works? Just to make sure that you like his/her style and things like that. It is quite strange that the guys here do not mention such option at all. Probably, they are just so sure of the quality of their performance that they do not provide any particular regulations for the cases of revision or moneyback dispute. On the other hand, they work 24/7, so, maybe, their support department know something about these issues? It would be also great to know which antiplagiarism systems Customessaywriter.co.uk use to check the texts. The adjective “different” placed before the word combination “plagiarism detecting software” does not look very persuasive. By the way, have they heard about Turnitin detector? Here ordering is quite a simple procedure. The order form introduces a lot of possibilities and options. But still there is something unclear about it. For example, a first-time user certainly cannot choose a preferred writer, but the so-called local TOP writer appears to be a paid option. Besides, nothing is said about customer personal account and communication with the assigned writers. It is very interesting to check how your total changes depending on the deadline you set. The less time you give the writer, the higher and less affordable this price is. On the other hand, it is really nice of them to do a title page, references and formatting for free. But still there are so many additional options which require extra payment that you may pick one of them simply by accident and therefore will have to pay considerably more than you initially expect. Confidentiality is guaranteed and this fact makes you feel at least somewhat safe. However, it would be even better if you could have a special policy which would provide protection of your personal information. Otherwise, how can you trust a service which does not prove its trustworthiness? 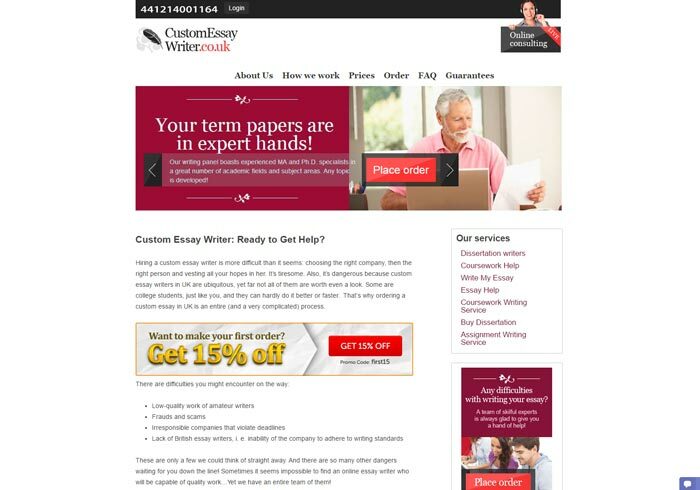 Customessaywriter.co.uk can provide you with academic papers of different complexity. You can have free and round-the-clock consultations with the local support team. However, these guys do not provide particular guarantees and explanations of the regulations they follow in their work, whether these regulations concern the pricing or customer data protection. So, speaking frankly, the general impression of these guys is rather negative than positive.